Following the poster reveal just minutes ago, Warner Bros. Pictures has released the Tomb Raider trailer teaser featuring your first look at footage from the upcoming reboot. Check it out in the player below and tune in tomorrow for the full trailer! From Warner Bros. Pictures and Metro-Goldwyn-Mayer Pictures, Tomb Raider is the story that will set a young and resolute Lara Croft on a path toward becoming a global hero. The film stars Oscar winner Alicia Vikander (Ex Machina, The Danish Girl) in the lead role, under the direction of Roar Uthaug (The Wave), with Oscar winner Graham King (The Departed) producing under his GK Films banner. 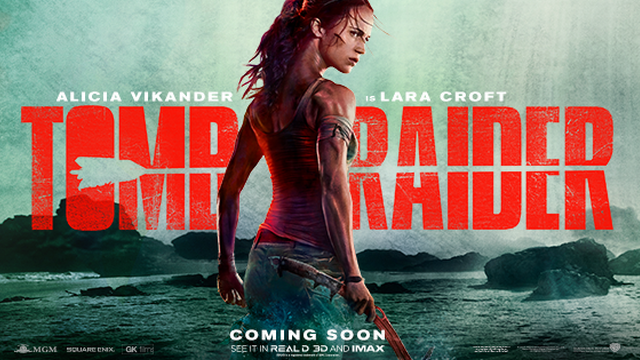 Opening in theaters on March 16, 2018, Tomb Raider also stars Dominic West (Money Monster, 300), Walton Goggins (The Hateful Eight, Django Unchained) and Daniel Wu (AMC’s Into the Badlands).